Jardin des Pins, Château, Fontainebleau. “Le corps du Bâtiment que l’on voit dans l’angle Septentrionale de ce Jardin, près de la Galerie d’Ulisse, porte le nom de Vertumne et de Pomone, parce que les amours de ce Dieu et de cette Déesse sont représentés en deux Tableaux à fraisque du dessein de Saint Martin [Primaticcio], sous un pavillon quarré, soutenu par quatre pilastres de gresserie d’ordre composite, couronné de frises, corniches, et chapiteaux aux Chiffres de François I. qui l’a fait construire, et orné de plusieurs têtes de divers animaux et chiens de chasse d’une parfaite beauté. “Vertumne Dieu du Printems devint éperduëment amoureux de Pomone Déesse des Jardins, et prit toutes sortes de formes pour parvenir à ses fins. Lassé de son peu de succés, il se transforma en vieille, et obtint ce qu’il désiroit en lui contant des histoires d’Amans punis pour leur peu de tendresse. “ — Des nymphes cultivans un jardin, où l’on voit à l’entrée la statue du dieu Priape. Gravé au burin par le même Léon Daven … Peint à fresque dans un cabinet dans le jardin de Fontainebleau, au bout de l’allée qui est bordée par la galerie d’Ulisse; il y a dans ce mesme cabinet, qui est tout ouvert, un autre tableau représentant les amours de Vertumne et de Pomone, qui est certainement du Primatice; cependant les ornements qui environnent ces deux sujets sont les mesmes et du dessein du Rosso. Seroit-ce que le Rosso et le Primatice  auroient travaillé con jointement dans ce lieu, qui a été peint et bâti sous François Ier, ainsi qu’on le peut connoistre par les salamandres qui sont dans les chapiteaux des colonnes et pilastres qui soutiennent le toit? Ces peintures sont au reste très-endomagées. J’écris ceci en 1723. Already in 1859, Reiset, correcting the evidence given by Dan and Guilbert, identified Fantuzzi’s etching of Vertumnus and Pomona (Fig.E.62a) as representing Rosso’s painting in the Pavilion of Pomona. He also identified Master L.D.’s [Léon Davent’s] etching, which he titled Men and Women cultivating a Garden at the Base of a Statue of Priapus (Fig.Davent, see below) as related to Primaticcio’s painting in this garden pavilion. Mentioning Mariette and Guilbert, Herbet, in 1896, made the same identifications, and pointed out (Herbet, I, 1896, 77, 16) the inscription on Master L.D.’s [Léon Davent’s] print: A: fontene bleau. Dimier, 1897, 77-79 (correcting the false placement of it by Palustre and Molinier), identified the pavilion, and then to the evidence already known he added (1900, 37-40, 312-314, 319, 434, no. 59, 489, no. 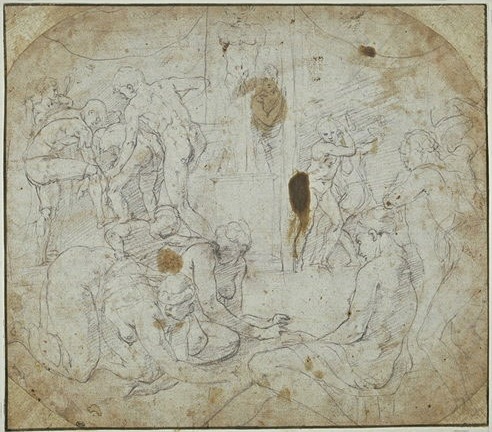 15) a black chalk sketch in the Louvre (Fig.Paris, 8571), which he recognized as an early sketch by Primaticcio for the scene more fully represented by Master L.D.’s etching, and another drawing, also in the Louvre (Fig.D.46Aa), which he accepted as Rosso’s and identified with Fantuzzi’s etching that had been associated with Rosso’s fresco in the Pavilion of Pomona. He also identified Fantuzzi’s Cartouche with Satyrs (Fig.E.63) as representing the stucco frames that were in the lost pavilion, noting that it must represent both of them as Mariette states that the two were alike. 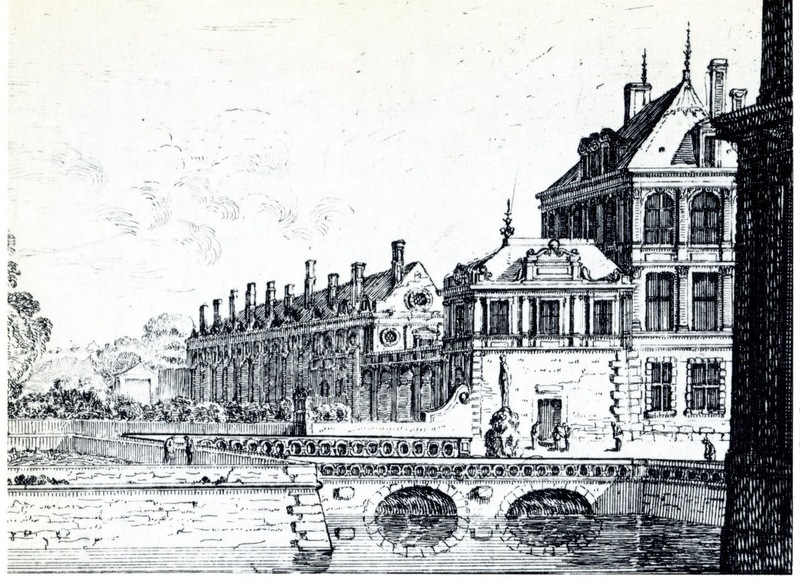 Furthermore, he pointed out that the pavilion appears on François d’Orbay’s plan of Fontainebleau of 16821 and in a seventeenth-century print by Israël Sylvestre (Fig.Sylvestre, Grotte, see below). Bacou and Béguin (EdF, 1972, 137, under no. 145) added to the evidence for the decoration of this pavilion a very finished drawing ascribed to Primaticcio, in the Koenig-Fachsenfeld Collection (Fig.Koenig-Fachsenfeld),2 that is related to his drawing in the Louvre and more closely to the print by Master L.D., and also a painting, in a private collection, which they identified as a copy of Primaticcio’s lost fresco (on which, see below). As indicated by Guilbert and Mariette, the frescoes of the Pavilion of Pomona had badly deteriorated by the beginning of the eighteenth century. Herbet (L’ancien Fontainebleau, Fontainebleau, 1912, 420, according to Kusenberg, 1931, 96, 200, ns. 210 and 211) reported that in the eighteenth century the pavilion had been used to store glass and that it was destroyed in 1765-1766 at the time that kitchens were built on this site. Dimier, 1904, 89, states that Rosso directed the decoration of the Pavilion of Pomona and that its two pictures represented Vertumnus as an old woman, inspiring Pomona with love, by Rosso, and the Gardens of Pomona, by Primaticcio. Dimier, 1928, 8, mentions again that the two paintings were by Rosso and Primaticcio, and that the stuccoes were by Rosso, and as done in 1532-1535. Kusenberg, 1931, 93-96, 200, ns. 199-211, gives Dimier’s reconstruction, but as done before April 1534. 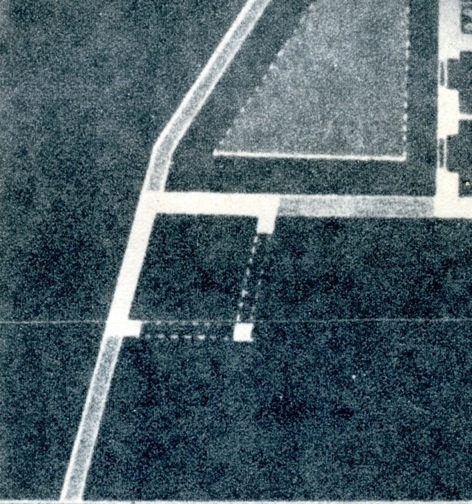 Venturi, IX, 5, 1932, 197, confuses Dimier’s reference to the Pavillon des Poêles with the Pavilion of Pomona. Herbet, 1937, 363, as done in 1534-1535. Dimier, 1942, 23, decorated with Primaticcio. Barocchi, 1951, 213, 251, mentions Rosso’s and Primaticcio’s compositions and Fantuzzi’s etching of the frame. Georg Kauffmann, “Poussins ‘Primavera,’” Walter Friedlander zum 90. Geburtstag, ed. G. Kauffmann and W. Sauerländer, Berlin, 1965, 96, relates Primaticcio’s scene to Ovid’s Fasti, IV, 395-404, where it is told of the first man’s eating the plants that the earth naturally produced, and then, under Ceres’s guidance, of his cultivation of the earth. Freedberg, 1966, 583, as done in 1532-1535. Béguin, RdA, 1969, 106, mentions Primaticcio’s preparatory drawing in the Louvre, Inv. 8571. Bacou and Béguin, in EdF, 1972, 136, Fig. 137, 139, discuss Louvre Inv. 8571. Claude Lauriol, in EdF, 1972, 482, says the pavilion was built in 1533, decorated around 1535, and destroyed in 1766. Kauffmann, 1973, 104, identifies Primaticcio’s scene again with a passage from Ovid’s Fasti. Béguin, in Actes, 1975, 200, 203, Figs. 3-5, 227, n. 7, discusses and illustrates the print by Master L.D. 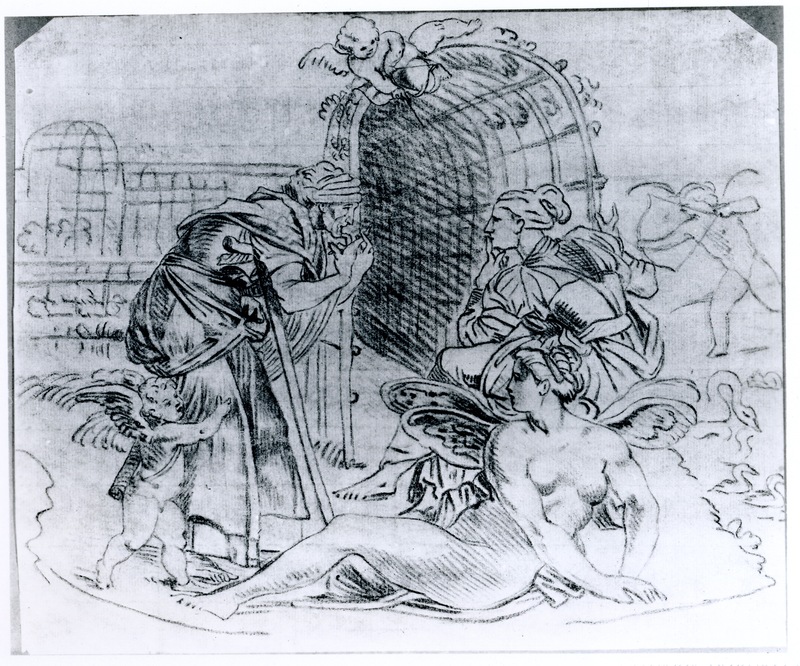 of Primaticcio’s composition; the Louvre drawing, Inv. 8571; and the “modello” in the Koenig-Fachsenfeld Collection in Fachsenfeld; and dates the Pavilion of Pomona 1534-1535. Golson, in Actes, 1975, 231-240, discusses the sources for the Pavilion of Pomona, its place within the history of garden structures, and indicates that the authorship of the stuccoes is still to be clarified; she thought the pavilion may have been built with reference to the hopes for concord and prosperity from the marriage of Francis I to Eleanor of Austria. Guillaume and Grodecki, 1978, 46, mention the pavilion as decorated in 1534-1535. Béguin, 1982, 27, 28, Fig. 1, discusses the Louvre drawing, Inv. 8571, and dates the pavilion 1531-1535. Orazzi, 1982, 130-132, the pavilion designed by Vignola with frescoes by Primaticcio, but admitting that if one fresco was by Rosso the attribution to Vignola would be impossible. Guillaume, 1985, 39, as built in 1534-1535. Prinz and Kecks, 1985, 345, 347, 425, as done in 1534 or in 1534-1535. Woodbridge, 1986, 60, Fig. 5 (etching by S. Israel), 61. Carroll, 1987, 30, 198-207. Scailliérez, 1992, 128-129, under no. 55, as done 1532-1535. Brugerolles and Guillet, 1994, 40, under no. 15, and 68, 70, n. 17, under no. 24. 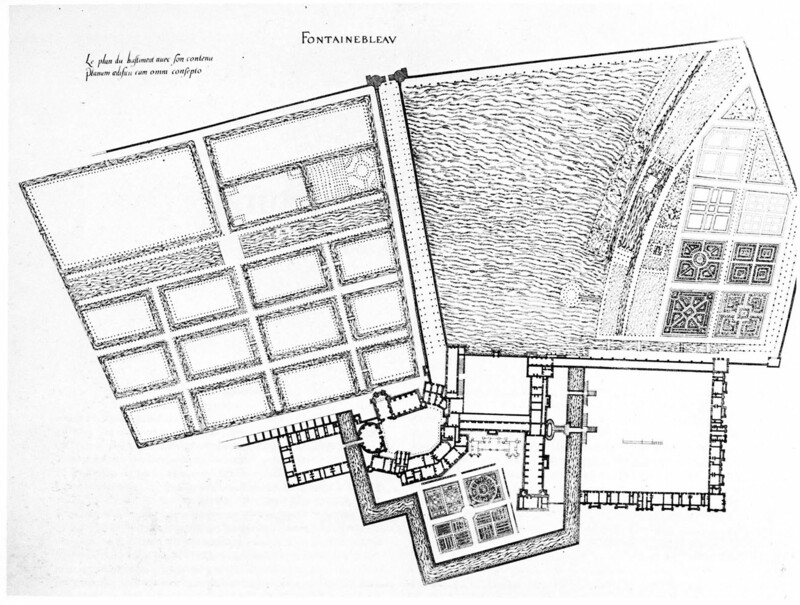 With the specifications of its location given by Dan, Guilbert, and Mariette, the Pavilion of Pomona can be located on Du Cerceau’s etched plan of Fontainebleau and its gardens of 1579 (Fig.Du Cerceau Plan Extended).3 It appears to be at the very far right of the plate as a small structure set within the corner made by the west and north walls that enclosed the Jardin des Pins. These walls appear to abut the south and east sides of the pavilion so that the pavilion juts out slightly beyond the limits of the garden formed by its walls. 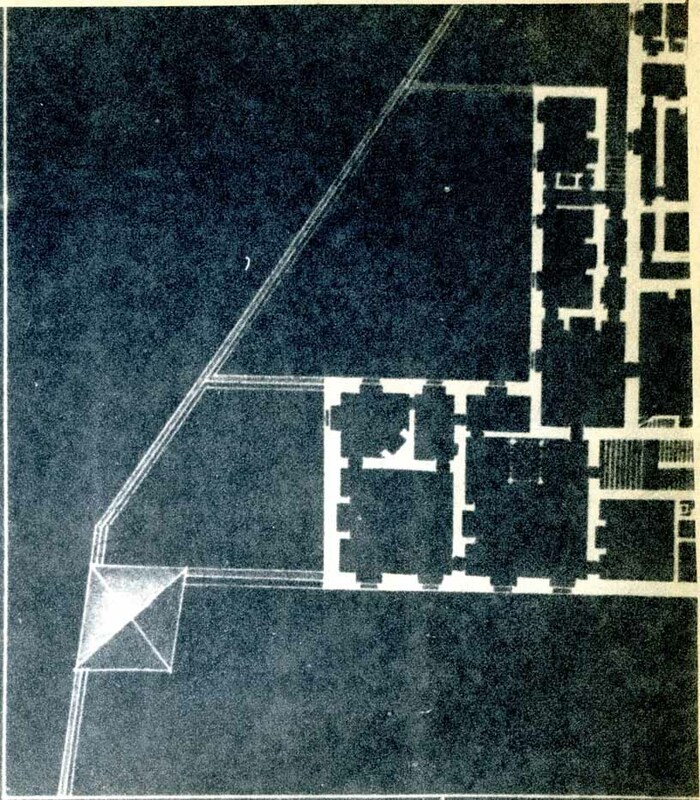 Although its sides are of equal length in Du Cerceau’s plan, its shape is slightly rhomboid rather than square.4 Du Cerceau’s view of Fontainebleau from the north shows the outside north face of the pavilion and its roof. The north wall up to the lower edge of the roof is roughly square, including the base and the entablature that slightly project at the sides. The steeply pitched roof is about as high as the wall proper and is cut off straight at the top. There appears to be open decoration along this edge. It is likely that from the east and the west the roof rose to a point like the other roofs of the château. It can also be seen in this view that the north garden wall goes up to the level of the lower level of the cornice of the north wall of the pavilion. 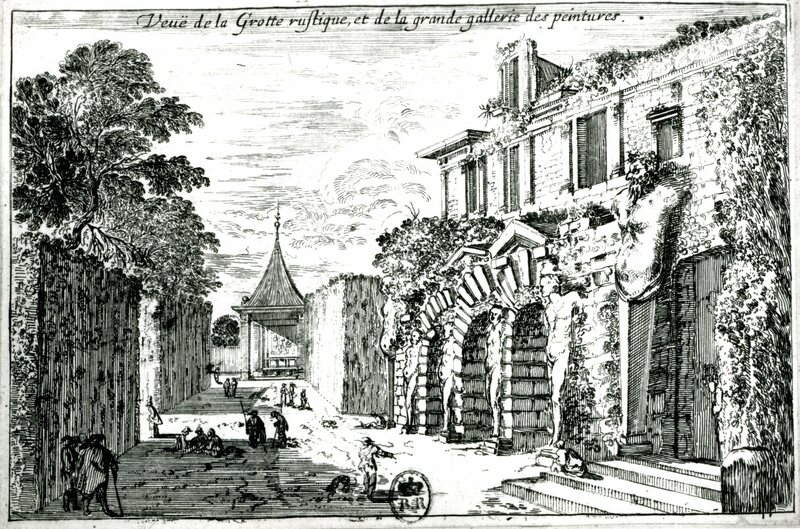 The only clear view of the Pavilion of Pomona from the garden side is that in the background of Israël Sylvestre’s Veuë de la Grotte rustique, et de la grande gallerie des peintures (Fig.Sylvestre, Grotte), published in 1649.9 Sylvestre’s etching gives a somewhat fancifully elaborated depiction of the grotto, which still survives at Fontainebleau, but the Pavilion of Pomona appears quite simply described. 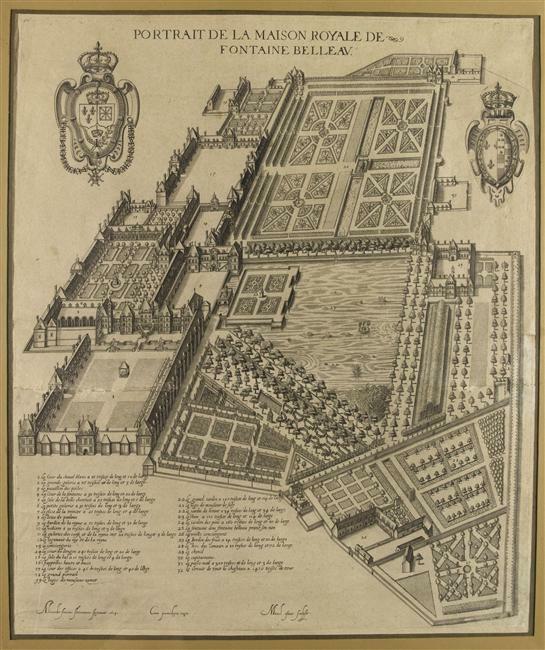 It can be seen as a square structure with its square piers as indicated on the plans of it and in the 1614 view of the château and its gardens. It also shows the garden walls abutting it with the west wall about the height that it appears in the 1614 view; the north wall is much higher as in Du Cerceau’s print, but rises higher than that in the sixteenth century view to a level above the cornice of the pavilion rather than to the lower edge of the entablature. The roof apparently terminates in a single point as in the 1614 view and in the Morgan Library plan. It is possible that this very high roof and the higher garden wall are alterations of what originally existed.10 The wall seems to match the interior garden walls that do not exist in Du Cerceau’s view but that can be seen in the 1614 view and in Sylvestre’s etching, although not with the same design in these two prints. The piers could have composite capitals as indicated by Guilbert. As he mentions four piers – “quatre pilastres”’ – one has to assume there was also a pier in the northwest corner of the pavilion where its outside walls met and this could be seen as following through what Sylvestre shows although this corner is hidden in his view. It also does not show the “Chiffres de François I” or “sa Devise” or the salamanders mentioned by Dan, Guilbert, and Mariette as ornamenting the capitals, cornices, and friezes, nor the decoration of “têtes de divers animaux et chiens de chasse” described by Guilbert. One might conclude that all this decoration adhered closely to the architectural membering and hence was too small to appear on the pavilion in the far background of Sylvestre’s etching where even the foreground elements are laconically described. If the exterior appearance of the pavilion is rather simplified in this print so, too, one would expect the interior of it to be. Only the west wall can be seen with an attached pier at the left and an entablature at the level of its capital, as appears also on the exterior of the east side of the structure. The breadth of the wall is reduced by two architectural strips at the left. At the bottom of the reduced breadth of this wall are three square panels with perhaps a small upright rectangular one at the left (suggesting that another one would have been at the right hidden behind the front right pier) above a bench, supported by three (the fourth at the right blocked from view by the forward right pier) brackets, spanning the width of the wall between the outermost strips flanking the attached piers. The west wall itself is occupied by a square picture with a plain strip of about the same width as the architectural strips framing it on three sides (and by implication on the top fourth side that is in shadow). Although the interior walls of the pavilion were about five meters square, the area of the fresco, because of the architectural strips and the framing strips, would have been about three meters square. It is here that the etching comes in conflict with some of the other evidence on the decoration of the Pavilion of Pomona. Mariette is the only author who mentions the frames of the two frescoes in the pavilion, stating that “les ornements qui environnent ces deux sujets sont les mesmes et du dessein du Rosso.” Sylvestre’s print shows no decoration whatsoever but this could be because it was too small to be represented on the strip he shows around the picture on the west wall. 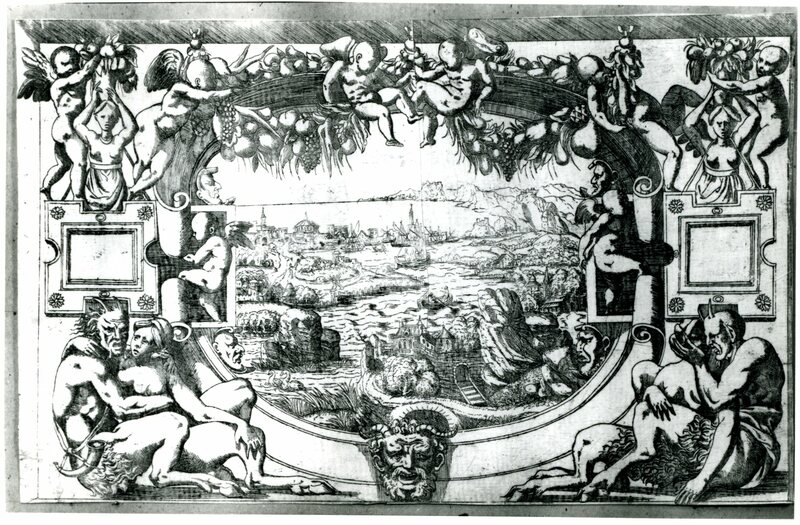 Furthermore, the etching by Fantuzzi (Fig.E.63) that has been related to the frames in this pavilion shows the ornament in a horizontal rectangle surrounding an oval area that would have contained the frescoes by Rosso and Primaticcio. The copies of a drawing by Rosso (Fig.D.46Aa and Fig.D.46B) and Primaticcio’s drawings for their respective frescoes show their scenes within horizontal ovals. But Léon Davent’s etching of Primaticcio’s scene (Fig.Davent)11 and Fantuzzi’s of Rosso’s (Fig.E.62a) show them in square formats, although both also made prints with other scenes in ovals. 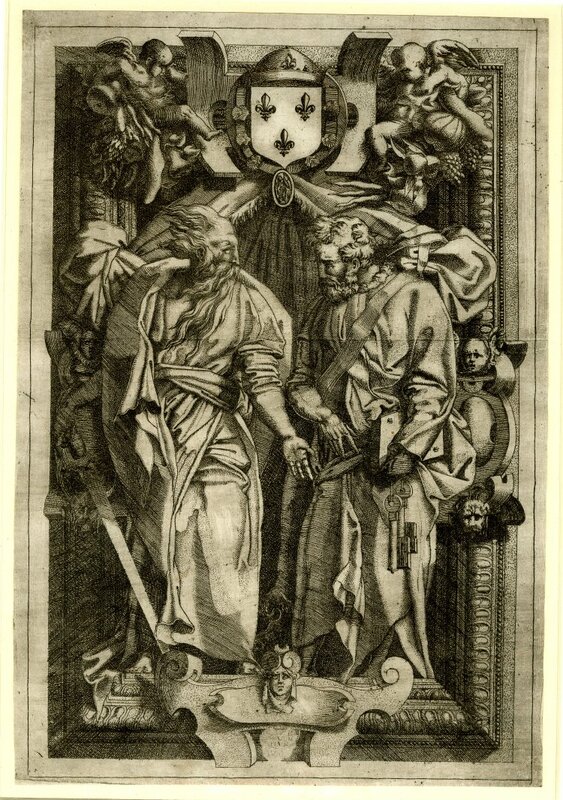 Fantuzzi’s print also contains two swags of fruit hanging from a lintel above and two slabs at the sides with volutes at the top and masks above and below that constitute a kind of frame. But this is not a frame that would occupy the strip that surrounds the picture in Sylvestre’s etching. But neither is it the kind of frame that would seem to warrant Mariette’s comment, brief though it is, and his attribution of the design of the frames to Rosso.12 Perhaps, however, Mariette was referring to small frames that would have occupied the strips that appear in Sylvestre’s etching and that lie outside the area of Fantuzzi’s print. It should be pointed out that the very sketchily indicated painting in Sylvestre’s etching resembles neither Rosso’s nor Primaticcio’s scene as we know them from drawings and prints. Three or four shapes adumbrate what can be taken to be figures, hence indicating a picture on the wall. But it needs to be emphasized, too, that (except for the unknown painted copy) Sylvestre’s print is the only evidence for what the decoration of the Pavilion of Pomona may actually have looked like. The drawings and the prints, which are based on drawings, give evidence only of what was planned for the pavilion, and not of what was actually executed there. Because it is so simply described, the pavilion in its total appearance in Sylvestre’s etching seems convincing. There is nothing about it that suggests the slight elaboration that the Grotto has undergone. At the same time the pavilion has a sufficient amount of detail that not only indicates its function but also that resembles what appears in Du Cerceau’s prints and in the view of 1614. Its sides are square and have approximately the same dimensions as its plan. There is a bench fit between the piers of the west wall (and there was probably one against the north wall). Three square panels above it serve as wainscoting and as the back of the bench. The fresco is above them and hence in a position not to be damaged accidently by those using the pavilion. Furthermore, the fresco is also square and, therefore, not only corresponds to the paneling but is rather appropriately framed as well by the square opening across from it of the pavilion itself. If instead of this arrangement one substitutes the frame represented in Fantuzzi’s etching then the paneling would have to be higher or the strips at the sides in Sylvestre’s etching would have to be removed to provide a horizontal area for that frame. The wainscoting would then most likely not be composed of square panels. In either case the oval picture area would have to be somewhat less wide than the width of the picture shown in the print. It would be especially small if placed above the higher paneling. But with lower paneling and a wider wall the frames of the two frescoes would be rather tightly fit into the areas provided for them. Dimier was certainly correct in relating the copy of Rosso’s drawing in the Louvre, Fantuzzi’s etching of the same scene, and his etching of the frame with an oval center to each other and to the decoration of the Pavilion of Pomona. The drawing shows the appropriate subject. Its oval shape has straight vertical elements at the sides, above and below each of which is a mask of a somewhat old man set in a volute, as in Fantuzzi’s frame. Two swags of fruit hang from above. But neither the masks themselves nor the tilt of them is the same in the drawing and the print. Furthermore, the side panels are broad and solid in the drawing, while in the etching they are shallow boxes, each containing a standing putto. 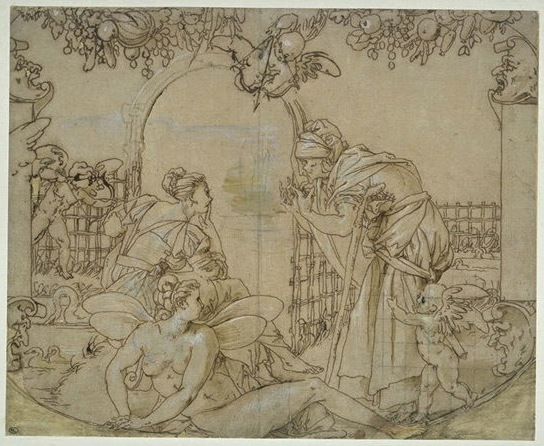 The side elements in the drawing are, however, almost identical to what appears in Fantuzzi’s reversed etching of the scene of Vertumnus and Pomona. But here the swags are raised and the wing that appears over the framing element at the left in the drawing does not appear. In the print the scene is also set in a square rather than an oval. The drawing, itself a copy and an incomplete one of a lost drawing by Rosso, is cut on all sides, so it is not possible to tell how much more of the frame Rosso’s original drawing included. The other copy of the lost drawing is even more reduced. Most important, in the Louvre drawing it is not possible to tell from what the swags hang, only that they must hang from something outside the oval area of the scene. Primaticcio’s drawing of a garden scene, in the Louvre,14 that has been rightly connected with his fresco in the Pavilion of Pomona, shows its composition again in an oval. At the top are, lightly sketched, two garlands that hang from something outside the limits of the oval and not visible in the drawing. The drawing is cut at the sides so one cannot know if any framing elements were originally included here. In the Koenig-Fachsenfeld drawing the scene is in an oval, and two swags again are lightly indicated above, although here, too, without any indication from what they hang. At the left is a band with a curved top and bottom that indicates a framing element that cuts off slightly that end of the oval. It vaguely resembles what appears in the copy of Rosso’s drawing but neither volutes nor masks are indicated. At the right of the drawing a similar band seems to be lightly sketched. Léon Davent’s etching of Primaticcio’s composition shows it in a square format, without garlands and without any indication of framing elements at the sides as are found in Fantuzzi’s etching of Rosso’s composition. It seems clear that Rosso and Primaticcio originally designed their frescoes for the Pavilion of Pomona as ovals that were to be surrounded by frames with straight elements at the sides, having masks above and below, and with two garlands hanging down that possibly covered the upper parts of their pictures. 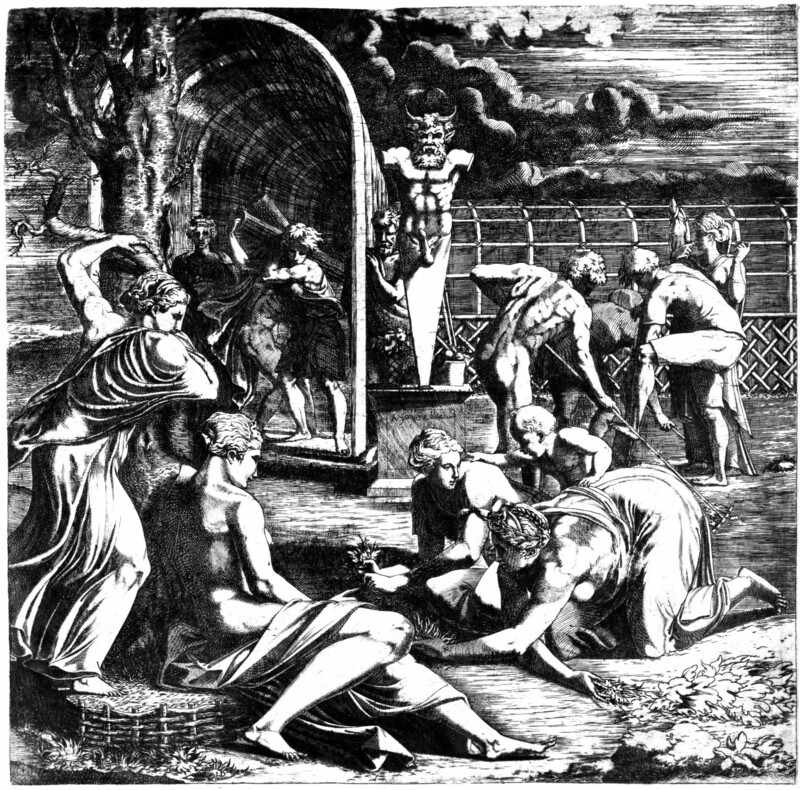 Fantuzzi’s etching of a frame surrounding a horizontal oval that has flat vertical elements at the sides is almost certainly derived from a finished drawing by Rosso for the frame of his painting of Vertumnus and Pomona. Here it can be seen that the two garlands were designed to hang not from the oval part of the scheme but from the upper surface of a recessed area into which the whole frame appears to be set. 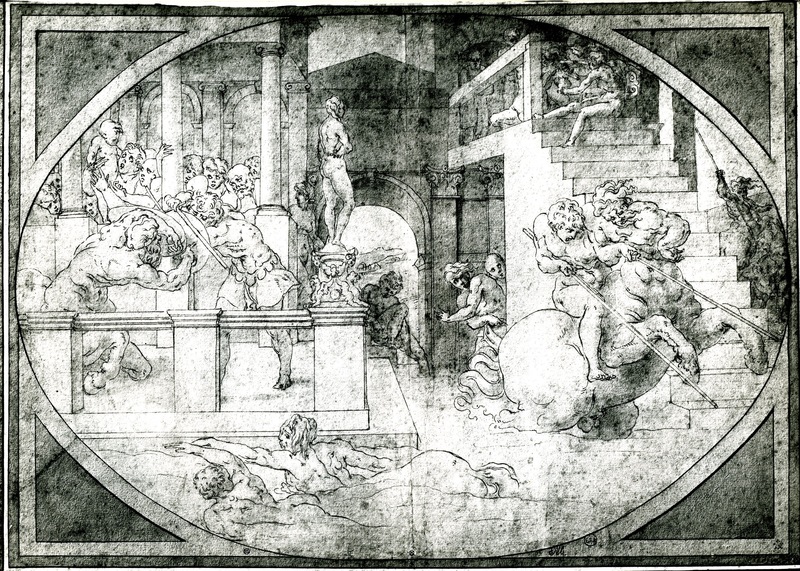 They hang from a comparable place in Fantuzzi’s etching of Rosso’s narrative scene. It can probably be assumed that all the elements represented in Fantuzzi’s etching of the frame were intended to be executed in white stucco, with perhaps some small gilt details, as in the Gallery of Francis I. The blank squares were probably meant to receive small stuccoes or paintings. Below would have been a wainscot, its panels probably coordinated in their alignment with the tripartite division of the decoration above. What, however, cannot be documented is that this scheme was actually executed. From the evidence of Sylvestre’s seventeenth century etching it was not. Here the one painting that is visible is square and is surrounded by an unadorned strip. There must have been frames of some degree of elaboration for they are mentioned by Mariette and their design – both were alike – was attributed by him to Rosso. It should be noted that Fantuzzi’s and Léon Davent’s etchings of Rosso’s and Primaticcio’s compositions fit very well into their square formats. 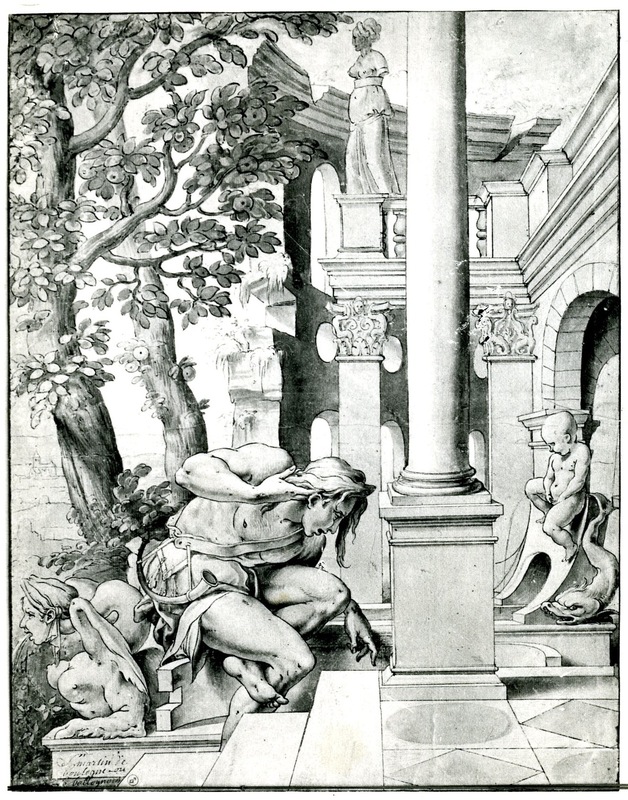 Furthermore, it is likely that the etchers, who made their prints from Rosso’s and Primaticcio’s drawings and not from their paintings and stuccoes, did not work from the one drawing by Rosso known from two copies, or from the Koenig-Fachsenfeld drawing (or Primaticcio’s original of it). Furthermore, in the Primaticcio drawings the swags hang so low that one mostly obliterates the area where the tunnel of trellis recedes into the distance. If this architectural motif was to have its effect in rapport with the one in Rosso’s composition than these swags could not hang so low. They do not appear in Léon Davent’s print and are placed high in Fantuzzi’s etching of the Vertumnus and Pomona, providing room, thereby, for some high trees in the background. These etchings may well be based on very finished drawings in which Rosso and Primaticcio had converted their oval compositions into square ones. There are no documents related to the construction or decoration of the Pavilion of Pomona. The dating of the decoration of the pavilion – or of the designs for it – is, therefore, dependent upon a consideration of the fact that it was a collaborative effort of Rosso and Primaticcio and upon the stylistic evidence of the drawings and prints of both their contributions. The Pavilion of Pomona is the only project that had works by the two artists planned to be seen together in the same space. But given the smallness of the pavilion, collaboration seems to have been hardly necessary. It is, therefore, possible that this joint project was done very soon after Primaticcio arrived at Fontainebleau and was looked upon as a first endeavor of a number of collaborations that would follow. Primaticcio’s composition has always been recognized as one of the earliest known works by him,16 although a precise date for it has never been argued on the basis of its relation to the admittedly few works by him with which it can be compared. Primaticcio arrived in France some time after 23 March 1532 and it is generally agreed that he was there very shortly thereafter.17 He is documented as having decorated the Chambre du Roi in the château at Fontainebleau between May or July 1533 and May 1535 and the Chambre de la Reine between February 1534 and May 1537.18 A drawing in the Louvre is now given to him as made for the Chambre du Roi but based on a conception and drawings provided by Giulio Romano.19 The central scene of the surviving fireplace decoration by Primaticcio in the Chambre de la Reine is derived from a motif by Giulio.20 In April 1535 Primaticcio began the decoration of the Porte Dorée with compositions of his own design.21 The drawings by him for his fresco in the Pavilion of Pomona, and especially the one in the Koenig-Fachsenfeld Collection, stylistically resemble most closely the Louvre drawing for the Chambre du Roi. In the Pavilion of Pomona, Primaticcio was working in coordination with Rosso, as the backgrounds of their compositions indicate, although probably with the understanding that Rosso, the older and more highly paid artist, was the director of the project. Primaticcio may have executed the stucco decoration designed by Rosso that framed the two frescoes. His fresco, however, was of his own invention and was not prescribed by Giulio, or by Rosso, as the two drawings related to it show. 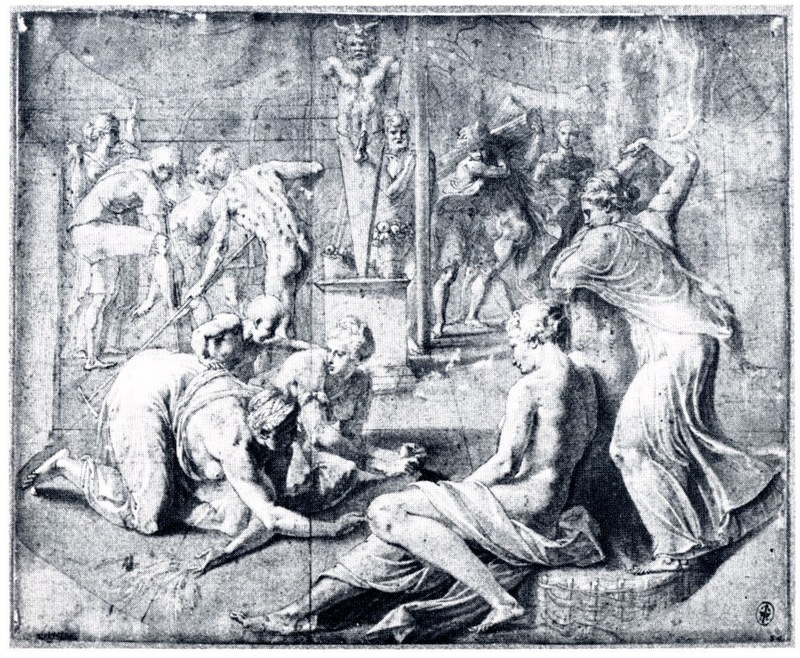 These drawings by Primaticcio are rather difficult to place chronologically, for while they might immediately follow the Louvre drawing for the Chambre du Roi, they could be of about the same time, their difference from the other drawing accountable to their being entirely Primaticcio’s own. 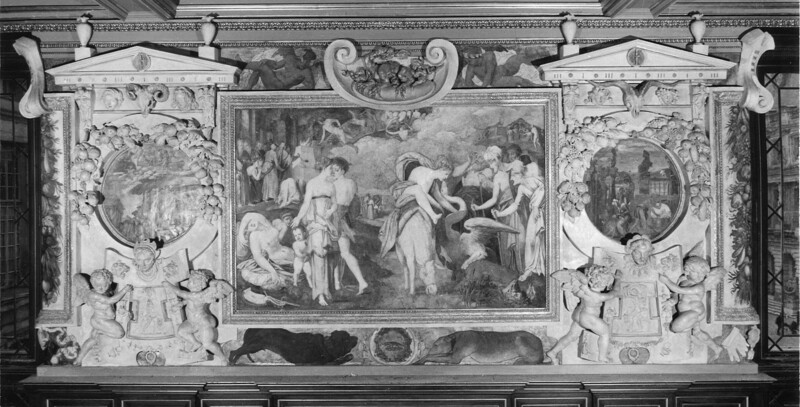 McAllister Johnson has dated the Louvre drawing 1532-1533, just in advance, that is, of the beginning of the execution of the project for which it was made.22 It is possible that the execution of the decoration of the Pavilion of Pomona actually preceded the work in the Chambre du Roi and was done early in 1533 or in 1532, very shortly following Primaticcio’s arrival at Fontainebleau. Otherwise one would have to place it in the period of the execution of the decoration of the Chambre du Roi or of the Chambre de la Reine. Rosso’s Vertumnus and Pomona resembles his Loss of Perpetual Youth in the Gallery of Francis I (Fig.P.22, II S a), although the latter has considerably more figures, which its subject requires. But both show figures in the immediate foreground whose forms are more or less aligned to the picture plane. In the center is a projection into space. This is also true of the Education of Achilles in the gallery (Fig.P.22, II N a), although it, too, has more figures in its variety of episodes. It might also be pointed out that the composition had been originally designed as an oval, known from the copy of Rosso’s drawing in Ensba in Paris (Fig.D.53), which was easily adapted to a rectangular format. 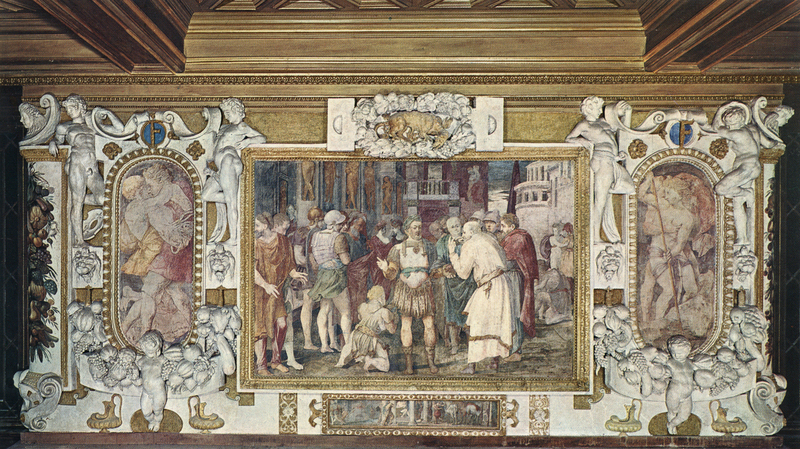 Both of these compositions in the gallery would seem to have been invented very early in the time of Rosso’s activity on this project, and before actual work began in the gallery itself in April 1534. 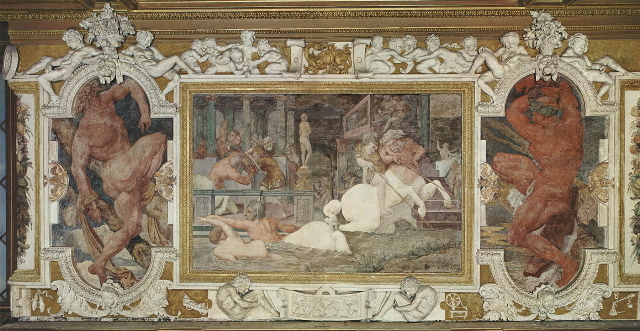 The frame that Rosso designed for the frescoes in the pavilion, known from Fantuzzi’s etching, contains figures of a size similar to those of the stuccoes of the frame of the Scene of Sacrifice in the gallery (Fig.P.22, VII N a), which seems also to have been designed before April 1534. There is, furthermore, a certain resemblance in the size and kinds of motifs of the frame designed for the pavilion with the stuccoes that flank the Unity of the State (Fig.P.22, VI S a), which would seem to date from before April 1534 as well. 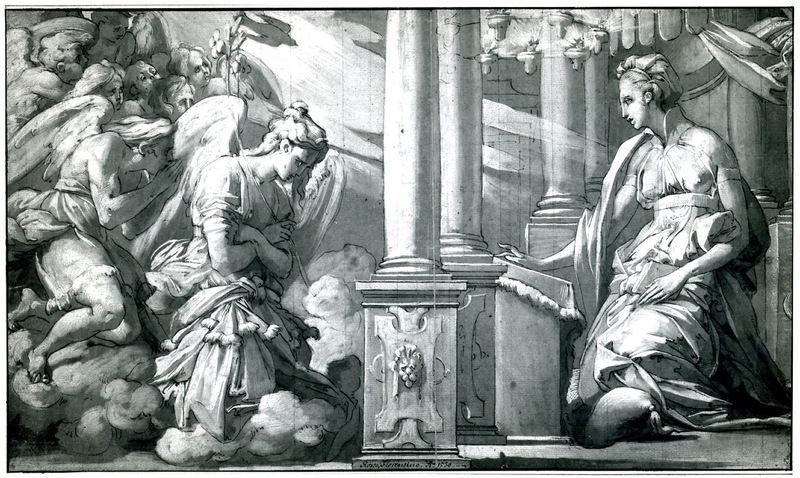 Rosso’s designs for the Pavilion of Pomona can also be associated with such early French works as the Annunciation in the Albertina (Fig.D.43a); the Narcissus, known from a copy in Turin (Fig.D.44); and with the St. Peter and St. Paul that survives in an engraving (Fig.E.8a) and etching (Fig.E.98a). However imprecise the dating of Rosso’s work for this pavilion is on the basis of stylistic evidence alone, it is reasonably clear that it can be associated with a time that, independently, can be judged to be approximately the same as that in which Primaticcio invented his composition. The execution of the stuccoes in the Gallery of Francis I was begun in April 1534, and perhaps already in 1533. Prior to this time Rosso must have been especially busy preparing the designs from which his assistants would work. It is, therefore, unlikely that he had the time from then on or for a considerable period before April 1534 to devote to the decoration of the Pavilion of Pomona. It is unlikely, too, that the decoration of this outdoor pavilion was executed in the winter. This would mean placing it not after the fall of 1533. But Primaticcio was engaged in the execution of the Chambre du Roi beginning in July of that year, if not already in May. Hence it is possible that the decoration of the Pavilion of Pomona was executed before that time in the spring of 1533. 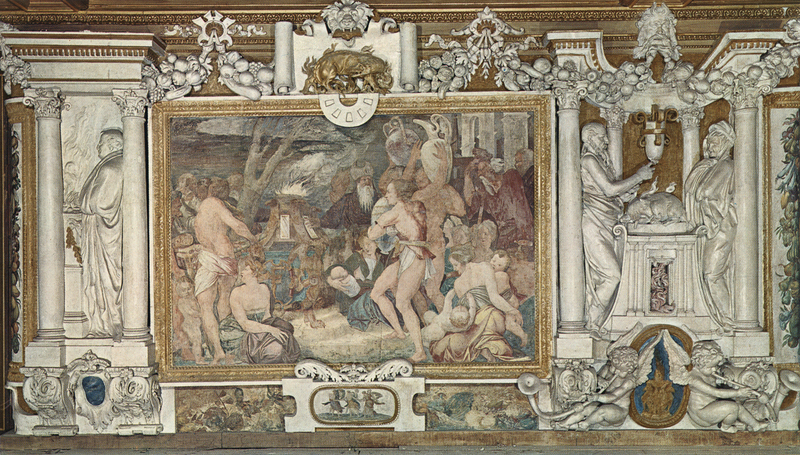 If, however, Primaticcio arrived in France in the spring of the preceding year, as is generally thought, then the Pavilion of Pomona might have been decorated in 1532 while both he and Rosso were waiting for the Chambre du Roi and the Gallery of Francis I to be prepared for the execution of their decorations. It might be conjectured that the decoration of the small Pavilion of Pomona served to show how Rosso’s planned scheme for the Gallery of Francis I, and Primaticcio-Giulio’s for the Chambre du Roi, would look, for nothing in the manner of this kind of decoration with large stucco elements framing frescoes existed in France. Primaticcio had been called to France because he was a stuccoer as well as a painter. 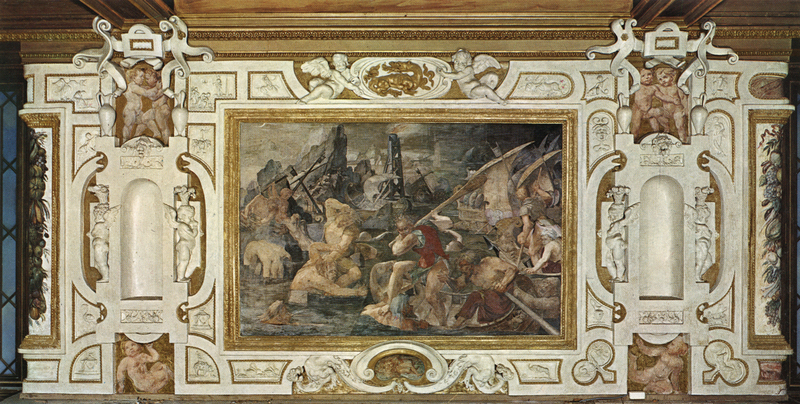 Vasari says that no frescoes were painted in France before Primaticcio’s arrival there. If there is any truth in this remark then there is some likelihood that the Pavilion of Pomona, with its stuccoes, was meant for Primaticcio’s execution, and with its frescoes may have been the first work of its kind at Fontainebleau by Primaticcio and Rosso, preceding also the supposed decoration by Rosso of the Small Gallery. A date early in 1533, or even in 1532,23 and the possibility that the decoration of the Pavilion of Pomona was planned with that of the Gallery of Francis I in mind can be associated with certain details that lend credibility to these hypotheses. It is very possible that the large frescoes on the long walls of the gallery were originally planned to be horizontal ovals in shape or that such a format was to alternate with horizontal rectangular frescoes. This is suggested by the shape of the copy of Rosso’s lost drawing of the Education of Achilles in Paris (see Fig.P.22, II N a, and Fig.D.53). This scheme was then changed to the one that was executed. As the plan evolved only the central image of the Nymph of Fontainebleau was to be oval, as is its replacement, the Danaë by Primaticcio. On the end walls were also two oval pictures, but they were upright and smaller panel paintings. Both paintings in the pavilion were planned as horizontal oval frescoes with elaborate frames. But if one takes the abbreviated evidence of Israël Sylvestre’s etching then it has to be concluded that this scheme was reconsidered and that the frescoes were executed in a square format. This decision could have had some bearing upon what occured during the planning of the decoration of the Gallery of Francis I, or else the decisions in both cases took place simultaneously as the result of a general dissatisfaction with too extensive use of the oval format. Looking again at Fantuzzi’s etching of Rosso’s design for the stucco frame planned for the pavilion, one might be inclined to find its oval center incompatible with the post and lintel architecture in which it would have been placed. 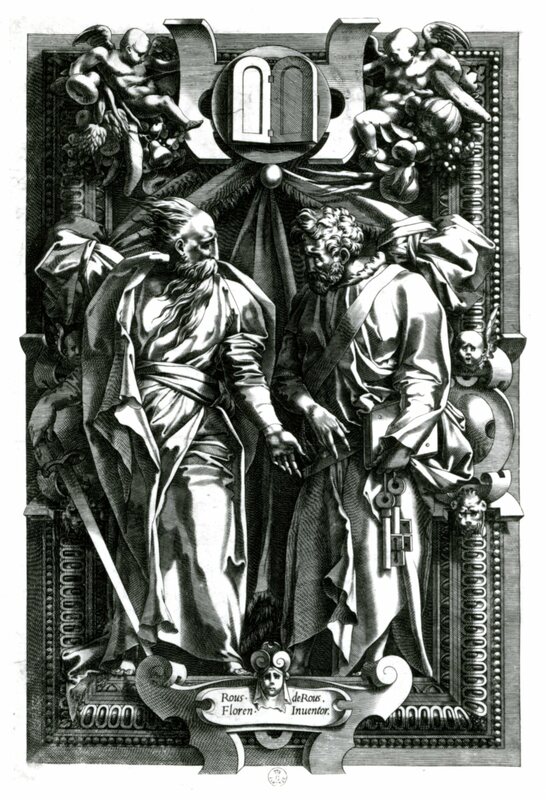 As two frames of the same design seems likely because of the unity this arrangement would have provided and because Mariette says the executed frames were the same, two with such large figures, richness of motifs and subsidiary scenes, as the print shows, does strike one as excessive, placed so closely together as they would have been. What, then, would other frames have looked like? They could have been something quite simple with flat stucco bands and small stucco motifs comparable to what surrounds the Revenge of Nauplius in the Gallery of Francis I (Fig.P.22, III N a), but confined within a narrow area around the two frescoes. 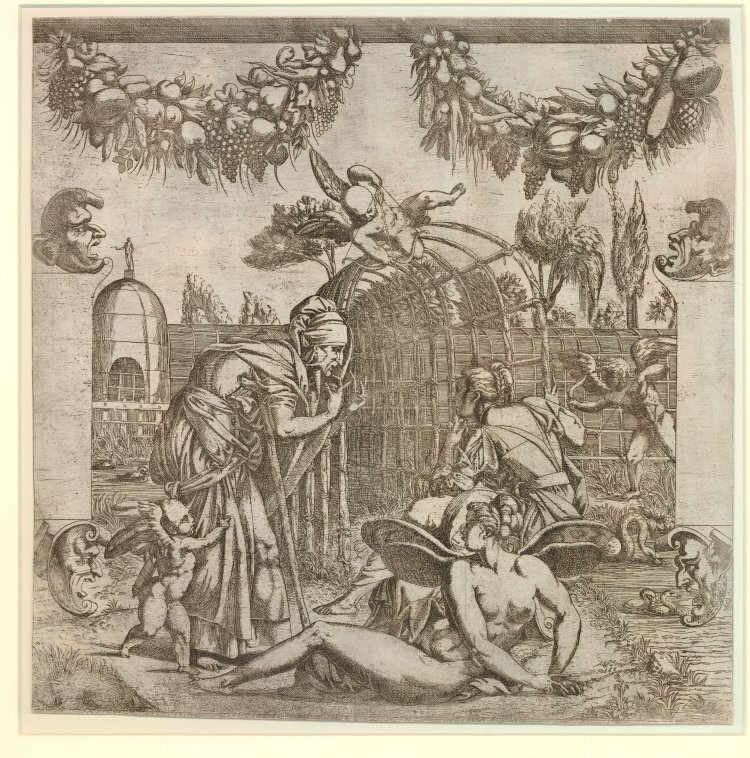 There might have been, as there is in the gallery, winged putti at the sides and something like the strips and masks that appear in Fantuzzi’s etching of the Vertumnus and Pomona (Fig.E.62a). From the lintel above, which is visible in Sylvestre’s etching, two swags of fruit may have hung down over the tops of both paintings. But the appearance of the strips, masks, and garlands in Fantuzzi’s Vertumnus and Pomona does not guarantee that these details, or the putti seen in the Louvre copy after Rosso and in the etching of the frame, were executed in the pavilion and there is no indication of them in Sylvestre’s print. Reading again the descriptions of Dan, Guilbert, and Mariette, one might be able to distinguish the decoration of the two parts of the pavilion. The architecture itself – which could have been designed by Rosso – would seem to have been ornamented with the king’s symbols, most likely the F and the F encircled with a crown. The capitals showed salamanders perhaps with Francis I’s motto: nutrisco et extinguo. Guilbert also mentions the heads of animals and hunting dogs as ornament. These details could have been part of the stucco frames surrounding the paintings.24 Although these heads do not directly pertain to the subjects of the frescoes, they do enlarge upon the theme of nature, with references to hunting, which in a sense complements the cultivation of the earth that the paintings and garlands indicate. The château at Fontainebleau had extensive gardens but it was also set near a forest famous for its wild game, and was itself in origin a hunting lodge. Although there are no documents that name the Pavilion of Pomona, there is one (DOC.14) that could just possibly be connected to it. At some time before the end of 1532, Lazare de Baïf, Francis I’s ambassador in Venice, was reimbursed for some “couleurs à fres” that he had sent to Rosso upon his request. This was three years before the frescoes in the Gallery of Francis I were begun. The colors for fresco painting that Baïf sent may have been for an earlier project, although the supply could have been sufficient also for the gallery. This earlier project would probably have been the decoration of the Pavilion of Pomona, in which case it was already being planned in 1532. This account of what may have been the character of the Pavilion of Pomona is based on much conjecture, it is true. But one question still needs to be entertained: did Rosso execute his own fresco or was it painted by an assistant, as was largely the case with the frescoes in the Gallery of Francis I? It may be that it was in this pavilion (and in the Small Gallery?) that Rosso began to train those who would soon execute the frescoes and stuccoes of the major project of his career. 1 Thomas, David, Renaissance Paris: Architecture and Growth 1475-1600, Berkeley and Los Angeles, 1984, 106-107, Fig. 63, where the pavilion is cut off but the legend for it is visible. 2 Béguin, in Actes, 1975, 200, 203, Fig. 3. The drawing appears to be executed in pen and ink, heightened with white, over black chalk, on dark washed paper. 3 See also Palustre, I, 1879, 180. 4 The print of Du Cerceau reproduced in “Galerie,” RdA, 1972, 14, Fig. 2, shows the sides of unequal lengths, which was not the case, as the plan in the Morgan Library shows (see below). 5 Paris, B.N. Inscribed at the bottom left: Alexander francini florentinns 1614, and at the bottom center: Michel asinius sculpsit. A rather rough copy of this view by A. Bosse is reproduced in Kusenberg, 1931, Pl. XXXI. 7 The scale on Du Cerceau’s plan of 1579 – no. 2 of his Fontainebleau set, “Le plan du bastiment avec son contenu” – is also in toises, but the plan of the Pavilion of Pomona would seem to be drawn too large, probably because the scale of the whole plan is too small to make possible any accurate record of this pavilion. 9 On the set to which this etching belongs see J.-P. Samoyault, in EdF, 1972, 328, nos. 427a and 427b. 10 In another view by Sylvestre (Guillaume, in Béguin, Guillaume, Roy, 1985, 16, Fig. 11) the roof is much lower, in fact lower than depicted in the prints of 1579 and 1614, but the structure in this etching is so distant, so dimly viewed, and such a minor part of this view that the information it gives is probably not reliable (Fig.Sylvestre, Ulysse). 11 Bartsch, XVI, 1818, 322, 43; Herbet, I, 77, 16; Zerner, 1969, L.D.7. 12 K. Wilson-Chevalier, in Fontainebleau, 1985, 136, no. 82, 137, no. 84, 138, Figs. 82 and 84, believed the frame of Primaticcio’s oval fresco was also designed by him, as it appears partially in a drawing by him in Ensba in Paris (M.1157), but she has no proof of this assertion, which goes against Mariette’s eyewitness evidence. 13 Béguin informed me in 1990 that the painting appeared in 1970 in a private collection in the south of France, that it is rectangular, and that it resembles Primaticcio’s drawing in the Louvre. I am not sure of the original shape of this drawing as some of its corners seem to have been repaired (see Bacou and Béguin, in EdF, 1972, 136, Fig. 145, 137, 139, no. 145). 14 Inv. 8571; see Dimier, 1900, above; and Scailliérez, 1992, 128, no. 55B, 129, Fig.B. 15 If this scene vaguely reflects what was painted on the west wall then it could resemble Rosso’s scene; the arrangement of shapes cannot be related to Primaticcio’s composition. 16 Bacou and Béguin, in EdF, 1972, 136, Fig., 137-138, no. 145 (Louvre, Inv. 8571), and Béguin, 1982, 27, 28, Fig. 1, indicate that it is one of Primaticcio’s earliest compositions, dating 1532-1535. 18 See Dimier, 1900, 256-262, 265-268; McAllister Johnson, 1969, 9, 18; and Béguin, in Actes, 1975, 199-205. 19 See McAllister Johnson, 1969, 9-18, and Béguin, in Actes, 1975, 199-202. 20 See McAllister Johnson, 1969, 14, 17, Figs. 22, 23. 22 McAllister Johnson, 1969, 15. 23 Herbet, 1937, 363, stated that the masonry of the walls seems to have been finished in 1533. On 28 March 1533 (new style), Le Breton was paid for “les ouvrages de maçonnerie des pans de murs qu’il a faits de neuf pour le Roy, â la closture du grand jardin…” at Fontainebleau (Laborde I, 1877, 54-55; see also, according to Herbet, Annales de la Société du Gatinais, 1915, 236). The payment could be for work that included the outer walls of the pavilion, which would have been also the walls of the garden. But it is not clear when all the work included in this payment was done. Some could have been executed a year or two earlier. This document does, however, suggest a period around 1532 or 1533 for the building and decoration of the Pavilion of Pomona. 24 There is one etching by Fantuzzi (Zerner, 1969, A.F.60, ill. A.F.61) that shows the frame of a square area composed of swags, the heads of animals and hunting dogs, and putti. But it seems to be a decoration to be placed above a fireplace, and its style points to Primaticcio rather than Rosso. Furthermore, its top part is far too large to fit into the scheme of the Pavilion of Pomona shown in Sylvestre’s print.